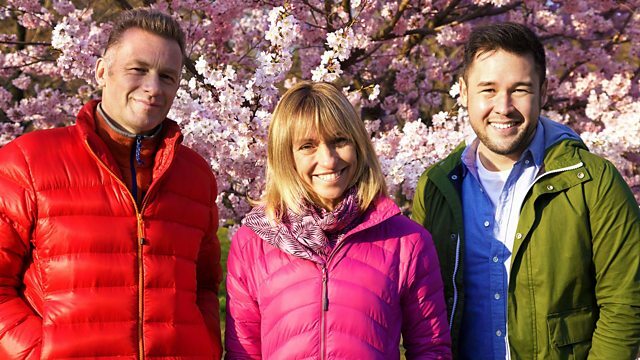 Chris Packham and Michaela Strachan from the BBC's Springwatch team join ethnobotanist James Wong to explore the origins of the Cherry Blossom Celebrations in Japan. Chris Packham and Michaela Strachan from the BBC's Springwatch team join ethnobotanist James Wong to explore the origins of the Cherry Blossom Celebrations in Japan. The blossom or "Sakura" is one of the world's most stunning seasonal wonders, with blankets of pink flowers sweeping across the country every year. James looks at the history of this famous festival, while Chris and Michaela discover the wildlife that live alongside the blossom. And all three find themselves joining the part with the crowds of Japanese "blossom watchers".